John Hersey’s vivid account of six Hiroshima survivors in the immediate aftermath of the blast was, for many, a window into the humanitarian cost of the end of the war. Having read Hersey’s account along with countless other scientific reports, political analyses and survivor reports, I naively thought myself numbed to the horrors of Hiroshima and Nagasaki. 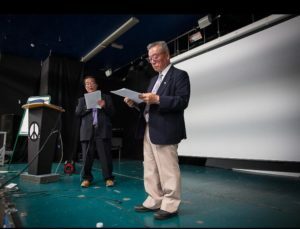 Recently at the Youth Peace Academy in Glasgow, I had the honour of hearing Mr Masashi Ieshima, a Hiroshima Hibakusha (survivor), share his experience. Mr Masashi was only three years old at the time of the bombing and yet has fragmented memories of the aftermath. He described how his family managed to escape but many of their loved ones did not. For survivors, the ramifications of Hiroshima would haunt them throughout their lives. All the academic books in the world could not have prepared me for hearing about the suffering and horrors first hand from a survivor – it was a truly moving experience. Mr Masashi is the Vice-chairman if the Tokyo Federation of A-bomb Sufferer’s Organisations. Despite now being in his seventies and having recently been diagnosed with what he believes is radiation-related cancer Mr Masashi continues to travel all over the world to share his story and campaign for a nuclear-free future. After sharing his story, he urged those attending to continue the struggle to outlaw nuclear weapons through peaceful means. Mr Masashi’s story and dedication to the cause has inspired me to evaluate my own contribution and ask what more I can do to bring the world a step closer to a nuclear-free future. It is a question which we all must ask ourselves and even the smallest contribution can help to make sure we never see another Hiroshima or Nagasaki. Niamh McGurk is a student at the University of St Andrews and a summer intern at the Edinburgh Peace & Justice Centre where she is promoting the 140,000 Origami Cranes project to raise awareness of the Treaty on the Prohibition of Nuclear Weapons (the Ban Treaty). Edinburgh Peace & Justice Centre is one of 468 partner organisations that collectively make up the International Campaign to Abolish Nuclear Weapons (ICAN) who were awarded the Nobel Peace Prize in 2017 for our work to promote the Ban Treaty.